Published Bestsellers: "Sue Hampton give us three very different stories, each with its own very appealing charm"
"Sue Hampton give us three very different stories, each with its own very appealing charm"
"Delightful short Christmas themed stories with a deceptively light style where the very different characters are all dealing with difficult but survivable situations in a very positive way. 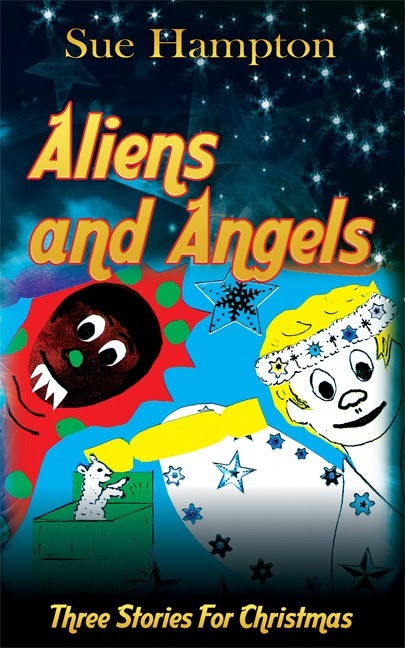 Aliens and Aliens uses a traditional school Christmas presentation (complete with globalobs) to casually mix multiculturalism, childhood squabbles and jealousies alongside growing excitement as Christmas draws closer. The description is gentle but so skilful. Then the slightly frightening dream leads beautifully to the neat twist which lets the main characters achieve their hearts desire so satisfactorily. Not without a carrot is a very gentle retelling of the Nativity with the addition of a troublesome but loveable donkey with a liking for carrots. The characterisation is sharp and comfortable as the situation develops into the well-known story. The description is strong but gentle and the illustration helps to develop the gentle feeling where the importance of the carrot is neatly put into perspective. Bootee for Etta is on a different level. This deals with the most difficult of the situations and does so in a very positive way. A young child suddenly away from family on Christmas Eve is quite a dreadful prospect. Oh no, where is this story going? The description is again wonderful and understated. The emotion is bouncing from the page in amongst the clear straightforward language which explains the story. As we learn about the characters and the problems they face the little touches of magic and wonder appear and help each one to learn how to deal with the situations that they don’t like. We are kept guessing right to the end, but of course, it’s Christmas so it has to be ok.
Sue Hampton give us three very different stories, each with its own very appealing charm."